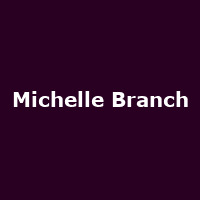 Michelle Branch is an award-winning American singer, songwriter and actress and founder member of the Grammy-nominated band The Wreckers, along with Jessica Harp. She released her debut solo album, "Broken Bracelet" in 2000, followed by: "The Spirit Room" (2001), "Hotel Paper" (2003) and 2017's: "Hopeless Romantic". She won a Grammy for the 2002 Santana song, "The Game of Love" on which she sang lead vocals.